Hi guys, Gotthammer here with a guide to making quick and dirty (and cheap!) terrain pieces with as little effort as possible. What follows is the making of a hill, representing the ancient site of an old fortification or roundhouse – however it is very adaptable! You can use it for making hills, mounds, barrows, hillocks tors and knolls (not the monster)! It won’t be winning any awards anytime soon, but it will give you a view into making some unique and characterful scenery with a minimum of fuss. Also, aside from cutting the foam, this is something parents or older siblings can get young ones involved in as it's basically painting and gluing. Scenery time is family time, but I accept no responsibility for pink ruins or glittery bunkers. Styrofoam: $0. I have never paid for foam. 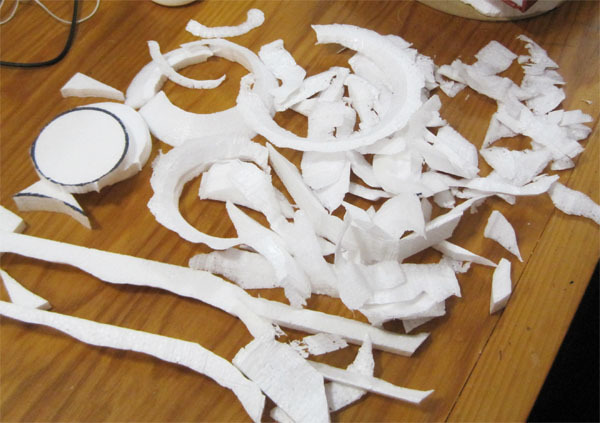 I salvage as many useful bits as I can from work and friends (my best friend’s wife saved foam for me when her parents bought a fridge!) etc. One good place to look is supermarkets, fresh veggies like broccoli and seafood often comes packed frozen in foam boxes which if you ask politely, you may be able to get for free. Spakfilla: Don’t remember how much (maybe $20 or so? ), but I’ve had that bag for ages, you don’t use much for scenery and many households will have this already. Bases: $2 each. Purchased from the craft section of the hardware store, but also available from craft and dollar stores. Flock/Scatter Material: Various prices. The round tube on the left cost me one pound from SiSt trees on sale – I bought seven of various hues. The larger cost more, $10 or so, but I use it vary sparingly so it will last a very, very long time. An important point is that if you are making a full board, you will need a lot of flock, as the whole board and all attendant pieces will need to be uniform for the board to look good. Plan ahead and don’t buy cheap if it means you won’t have enough to make all the stuff you need. Poster Paint: $1 each. Citadel paints look nicer, but cost 250 times as much for the volume. 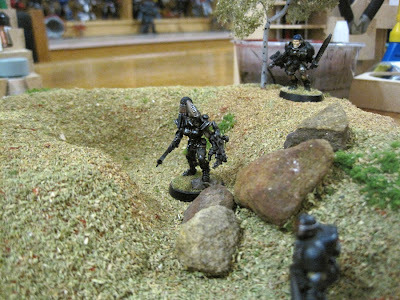 Besides, this is gaming terrain and it will be covered by flock in the end. PVA glue (aka white glue, elmers glue): $? but not much. Everybody already owns this stuff already for basing most likely. Foam Cutter: $30. A great investment. An ultra cheap alternative to the foam cutter is an ordinary kitchen knife held over a strong flame (ethanol burner, gas stove, zippo lighter), though it will need to be reheated repeatedly. I have been told submerging the blade in boiling water can work too. If using this method, be very careful as you will be working close to flame and the handle of the knife can get very hot! And the fumes, you don't want to be breathing any fumes at all so make sure you work outside or in a well ventilated area if you're planning on going this route. Cheap and nasty brushes: $2, for painting. Rocks: $0, from the back yard. Newspaper: $0, local – worth every cent. Keeps the table safe from harm. Baking tray: $5. Used for flocking the hills to collect ‘runoff’ material for recycling. Trees: Various. I use a tree to add some pizzazz to the hill. This is a fairly pricey one I had made by SiSt trees, but cheap ones (or painted sticks with flock glued on) are an alternative. So a very cheap project overall. The most expensive parts are either long lasting tools or just last a long time. So, on with the construction! Part 1 – Assembly and shaping the hill. 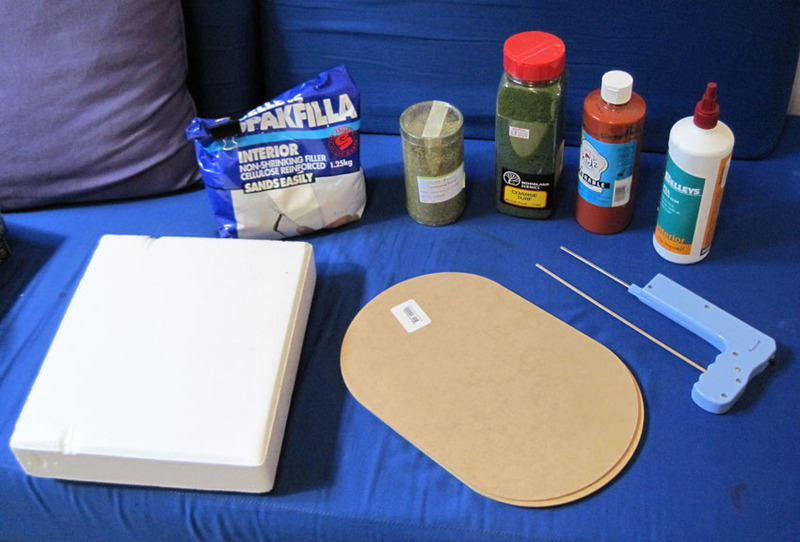 Step 1 to being a cheapskate scenery builder is planning – know what you want to do, get what you need and then do it. Being cheap doesn’t mean cutting corners in any way other than budget. Rushing the job and making a mistake will cost more in the long run than 5 minutes of planning in the beginning. For this hill I want it to be roughly donut shaped, with an opening at one side, and tall enough to completely block LoS for infantry. 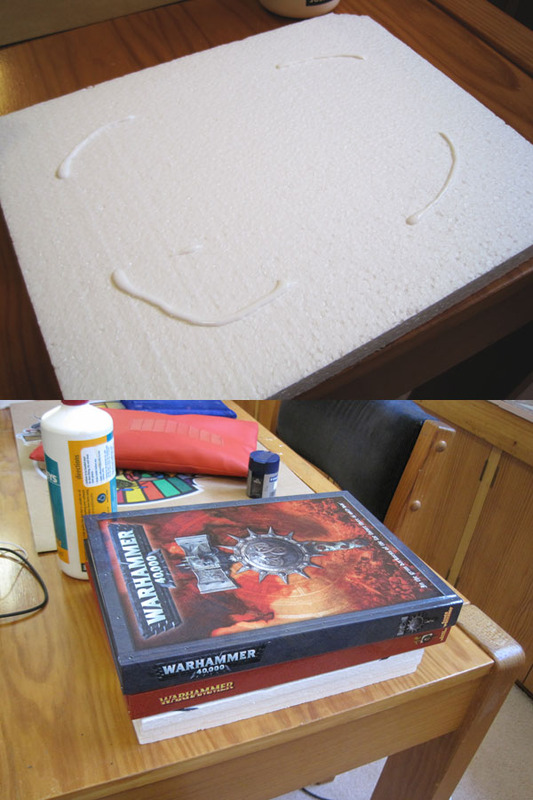 With this in mind I chose three thin squares of foam and sandwiched them together with white glue. I only put four little lines of glue as I would be cutting through the centre of the hill and will be cutting the edges back, so didn’t want to hit glue. Then I put it under some handy weights and left it to dry for a bit. Once dry, I got my large terrain base and a permanent marker. Dry fitting the foam to the large base, I marked out where the foam would overhang for cutting later. I also marked the rough centre and where I wanted to cut out in the middle. 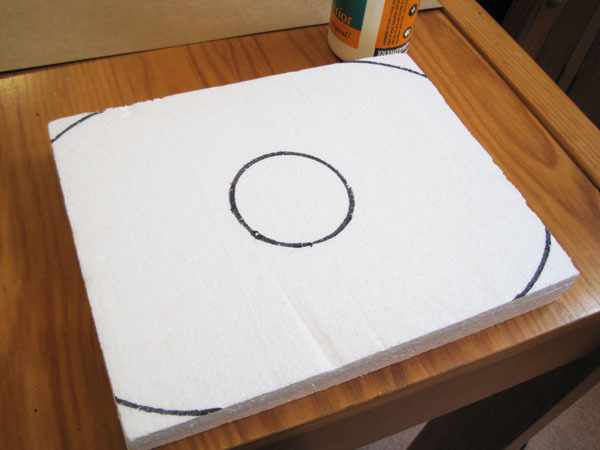 I made this circle by tracing a Dreadnought base to make sure the model would be able to comfortably stand in the middle. Planning Point! 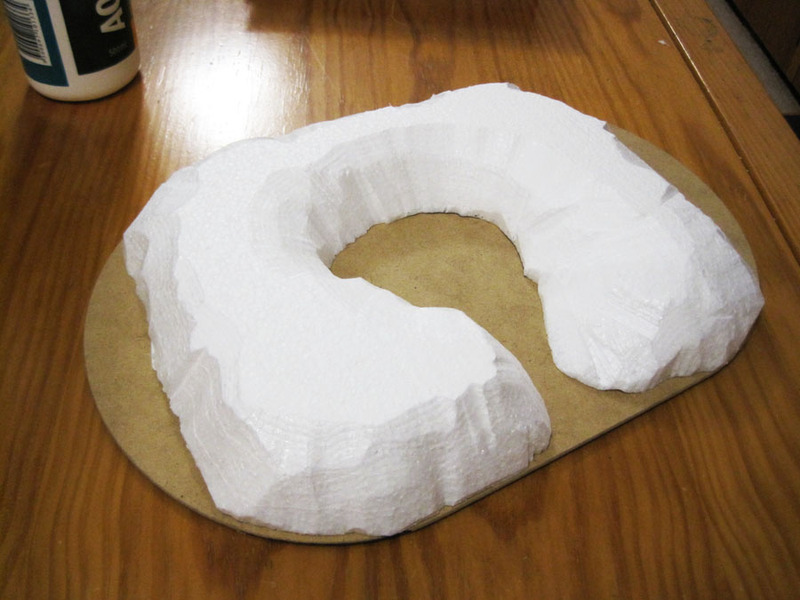 - Make sure the terrain piece is usable in a game! It’s no good making a great piece if nobody can stand on it without falling over, or can’t be placed on it due to density of shrubbery. 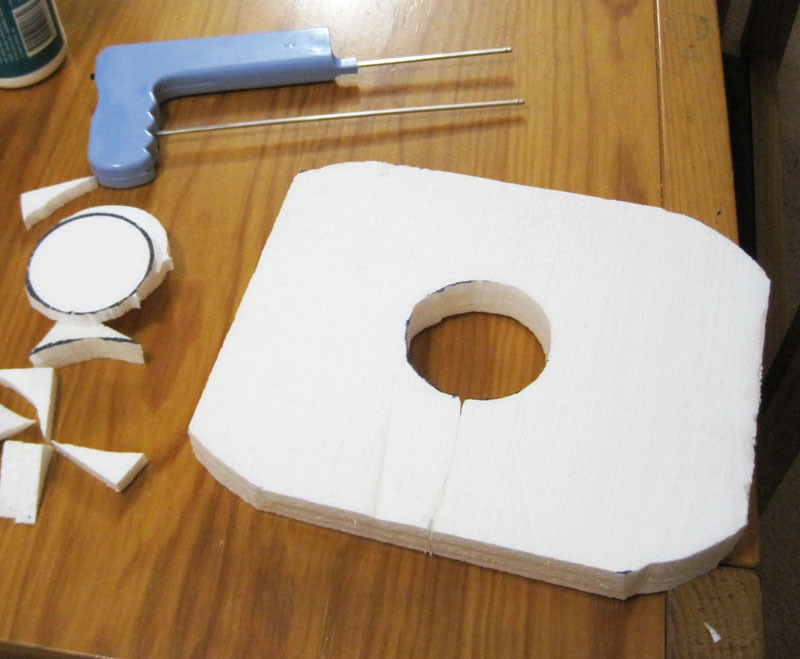 Taking the foam cutter, I trim the corners off and cut out the centre. Do this either outdoors or in a well ventilated area as the fumes are toxic! Then, still keeping with the cutter, I start to shave away the edges to give the hill shape. It doesn’t matter too much if there are jagged edges or roughness as the spakfilla will even it out. Unevenness also makes it look more natural. Once I’m happy with it I glue it to the base and stack the weights on it again. The tree I’m adding has a long rod sticking from the bottom - I'll simply trim it and stick the tree in the foam at a later point. There will be lots of leftover scraps at this point, look through them and save any big/interesting bits for later on and other projects. And that ends the basic construction of the hill. That took me about an hour with glue drying time included, which is time that can be spent painting minis or other things. It never ceases to amaze me what Col Corbane is capable of, I see bits here and there at the club, reading the blog and posts made it just shows what hidden talent is. @GSS - It's not mine matey, it's Gotthammers from Collegia Titanica. Ah, my bad, I must have been half a sleep when reading it. Glad you guys liked it :) If I can get the time I'll try to do some more simple cheapskate scenery writeups.